When you’re at home, you want to feel secure. The definition of the word ‘home’ is pretty much obligated to include something about feeling, well, ‘at home’, and this is precisely why people who have suffered break-ins feel take so long to get over it afterwards. Their place of security has been invaded, so no wonder they feel like their world has been turned upside down; in a sense, it has. Our Security Experts: Speak to our team to find out about the security tips and advice that we have to offer. Our team has many years of experience allows us to provide friendly, honest advice to ensure that you're able to protect your home or business. A huge proportion of burglaries are opportunistic. If a prospective burglar can’t see into your premises, then the temptation to break in is reduced. If they can’t see something worth stealing in your front room, why would they chance the risk of breaking in for (possibly) very little gain? Tall hedges and ill-kept landscaping can be a problem. If your hedges rise above the level of your windowsill, someone could easily hide behind them, and could use such an opportunity to scout out the promise of your home, or even try to gain entry. Trim your hedges and remove this chance. Very often, the garage is a major weak point in home security. We go to town with security on our homes, but leave our garages with wobbly windows and rusty padlocks. Such a mistake is even more costly if your garage has an internal door that leads into your home; you’re basically giving intruders a ready-made entrance into your property. Make sure your garage is as secure as your actual house. You may think that leaving a light on 24/7 is a great way to convince a burglar that you’re in, but such individuals will soon clock that it’s never turned off, and assume that you’re not in. Instead, utilise things like motion sensors or automatic lighting to activate lights when someone approaches your home, or even set indoor lights so they turn on periodically in the evening. 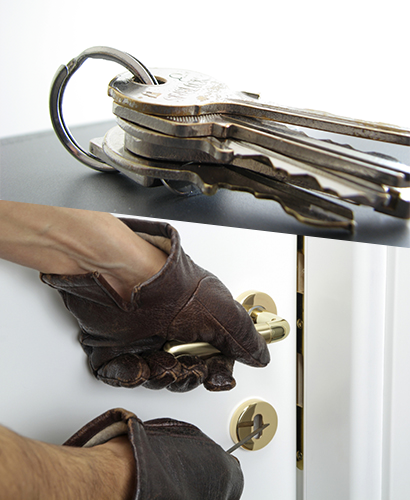 As we’ve said, burglars are often opportunistic, so if there’s even a chance of getting caught, they’ll think twice. Stay tuned to find out more of our top tips for keeping your premise safe. However, our own personal top tip would be to take advantage of our security systems in Bristol if you’re in the area. We can fit your home with solutions like burglar alarms, CCTV and even fire control, so you’re not leaving anything to chance. To find out more, contact our team by giving us a call on 01179 255755.